Where to after Te Anau? Well we have to be back home in 5 days’ time so Asti our wonderful home-garden-cat sitter can take off. Clyde and our friends Graeme and Barb beckoned. We first met them some years ago in the North Island, travelled with them for a while, spent one memorable New Years’ Eve with them and their daughter near Cambridge, and have kept in touch ever since. The drive from Te Anau to Clyde took us through some of the changing Otago countryside which I love. First through Mossburn then mostly north to the outskirts of Queenstown where we were lucky to get straight across the bridge, still under repairs, with long delays due to one-way traffic. Then east again alongside the Kawerau river to Cromwell and then south-ish again through the Cromwell Gorge to Clyde. Hard to believe that the Kawerau is part of the mighty Dunstan scheme. The Dam is indeed impressive. Graeme had told us of a free camp near the Clyde Dam, right beside the water. We were soon set up and ready to explore. The water was very clear and a secluded bay with a little beach was popular with people and dogs alike. We stayed there three nights with very variable weather. Early one morning I saw a long orderly line approaching: Those little ducklings could move very fast if needed! The first day was overcast with a few drops of rain, yet 35 km or so south Roxburgh had some of the worst floods in living memory! We had a wonderful dinner that evening with our friends at the Post Office in Clyde – highly recommended. The next day was fine and hot, but thunderstorms in the evening developed into heavy rain and as we’d left a couple of windows half open plus one roof vent, we thought it wise to make tracks back to the caravan soon after a delicious dinner at Graeme and Barb’s. It was our 13th wedding anniversary – one to remember! Thankfully the caravan was still bone dry. We had an invitation to camp on new-found friends’ deer, sheep and cattle property some way out of town, but first we did a quick tour of the Lake itself and had lunch near the small boat harbour which was showing the signs of a lowered Lake level; the entrance channel was very shallow indeed. Spotted in town; the latest in bicycles, a 5-seater ‘Spider’. We had thought to do a Nature Tour boat trip up Milford Sound if we could find a place to leave Penny for two nights. The plan was to put Penny in a Kennel, tow the caravan part-way and leave it in a camp before the Homer Tunnel, spend a night there, drive the rest of the way to Milford next day, do a day boat trip and return to the caravan late afternoon/evening and back to Te Anau – and Penny – next morning. There is only one Kennels business in the area, out towards Manapouri, so we took a drive to have a look then phoned them, and booked Penny in for next morning. But on the drive back ‘home’ we realised we didn’t have Penny’s vaccination record book, and without that the kennels would not take her. I thought of finding a dog sitter through ‘Pawshake’ similar to the one who looked after Penny for us when we were last in Australia but it seems there are none in the Manapouri – Te Anau area, rather surprising considering the number of pets travelling in motorhomes. So we decided to leave Milford Sound for another day (we have both been there before) and instead concentrated on a Glow-Worm Cave experience, a 2.25 hour adventure during which time Penny would be happy to stay in the well-ventilated truck. As she did. To reach the glow- worm cave one takes a 20 minute or so catamaran ferry trip up the Lake. Plenty of time to admire the clouds! Once at the Cave, photography is forbidden. One must keep silent, rather difficult I think for several young tourist children who were with our group. The adventure itself involves a short bush walk before entering the caves. The walking platform is very good and there are plenty of handrails, which I appreciated as I have almost no balance in pitch dark! After going up and down and admiring the rushing water everywhere, our group of about 10 embarked on a boat ride in total darkness (and hopefully silence) through wondrous caverns twinkling with millions of glowworms. The tours are so well organised that there must have been about 5 or 6 groups all at various stages of entering or leaving the tunnel and two boats at a time being silently propelled along by the guides holding ropes. Afterwards we were given tea or coffee and treated to a short presentation about the glow-worm lifecycle. Our friends’ property was about 25 k out of town, a long drive heading west and then north through wonderful scenery with views of the mountains. We set up the caravan for a few days, surrounded by sheep and, in the next paddock, deer. We had views of mountains on one side and a huge stand of trees on the other, and free use of a little house nearby, thus sparing our black water tank! Not far away was a public access road to the Upukerora River but when we finally reached it after fighting our way through long grass, it was not particularly imposing. After a few days, although Te Anau, our friends’ property and indeed the whole region are wonderful, it was time to move on. it wasn’t a very long drive from Clifden Bridge to Manapouri but how the weather changed. We went from overcast, drizzly and chilly to brilliant sunshine as we climbed the range. Round the corner, what a lovely sight – blazing gorse and distant snow-capped mountains. So very NZ. Downhill we soon came to the Waiau Dam, at first sight not particularly imposing but of very great importance, as the signs show. On to Manapouri, the most beautiful lake. Low cloud contributed to the moody scene. We stopped to inspect a large turbine and then noticed this sign on a huge rock. Another sign said that the lake level would have been right up to that rock if the full scheme had gone ahead. Seen in a local garden – a seal rather far from home! It was sitting in a little pond. When I first visited Manapouri on the back on Dave’s huge MotoGuzzi all of 17 years ago, we took a boat across Lake Manapouri then a bus to the power station then another boat to Doubtful Sound, and return. Motorbikes can be left behind for the day, but live fox terriers cannot, so we decided to forego nostalgia and go for a coffee instead. We had coffee and the inevitable whitebait pattie – an especially good one – in a converted church. An old organ sat in a corner. After a quick look round the near-deserted town – all the tourists were out on boats and the carparks were full to bursting – we continued to Te Anau. We left Invercargill on a lovely but slightly chilly day and headed west, through Riverton to Colac Bay where there is free seashore camping but in a very exposed position, so after taking various photos and admiring the multicoloured beach pebbles, we pressed on. Colac Bay must have some very artistic residents. The village’s name sign is a surfer in relief …..
….. but the piece de resistance to me was this school bus shelter, thoughtfully turned around to really give shelter from the prevailing wind. The strength of the wind can be judged by a shrub growing in a garden opposite the bus stop. Next along the coast was Monkey Island. Actually the shore near the Island, which is rather small! But although the camping area was much more sheltered, it was also very cramped and Dave had quite a time backing and turning the caravan around not once but twice as we tried to extricate ourselves. So we headed on and finally found shelter in a free park at Clifden Bridge. This is a wonderful old bridge which deserves the accolade given by the Society of Engineers: every inch demonstrates the workmanship of the early builders. A very curious thing, C H Howorth/Howarth (the name is spelled both ways) was the artist whose three works were donated to the Invercargill Art Gallery by my Great Aunt. At least I think it’s the same man. The artist definitely died in 1945. What a coincidence! The bridge spans the Waiau River. Below the bridge is a tramper pick up/drop off point for a jetboat. There were quite a number of people there when we arrived and also a little coffee/food caravan, probably hired to meet them. Good coffee! The Wairau cuts through limestone, which is still visible just below the bridge. It used to be NZ’s second largest river. Much has been done since then. The river flow is now reasonable. I will give more information in a later blog when we have been to Manapouri. There were lots of semi-tame birds hopping around the food cart. There was also a rooster from a nearby farm strutting around, particularly among the parked motorhomes and caravans. Some overseas tourists took many photos of it, I wonder what they though it was! Tomorrow we head for Te Anau. No visit to Invercargill would be complete without a trip to the Museum to pay our respects to Henry the 100+ year old Tuatara. Here he is, plus some other Tuataras almost as big as him, so probably not his offspring. The Tuatara breeding program at the Museum is one of the best (the only one?) in the world. There is a wonderful display of Victoriana too – I wonder if any of the articles once belonged to my great grandfather and his second wife? Southland Rugby followers are an avid lot. These hay bales in the team colours (well, pretend the black is maroon) were spotted on the way back to the Lgnite Pit. We’ve also seen a few bales in bright turquoise and purple but most of them are now back to a pasty green. We left the Lignite Pit next morning. Here is the view looking down from the caravan – I took a photo in the previous blog on the footbridge in the far right distance. We had another essential visit – to the grave of Great Grandfather Frederick Wentworth Wade and his wife Ada. Last time we visited, the cross with Ada’s name on it had been shifted to another grave, but I retrieved it. I was glad to see it had not migrated again. I really do hope to get the monument repaired soon and a plaque attached because my Great Aunt Fonna is also buried in the grave with her parents. The cemetery is well looked after, the grass freshly mown. Next day we shifted to the Lignite Pit, a rather interesting place 20 k out of invercargill which we discovered on a previous trip. Formerly an open-cut lignite mine, once working stopped it filled up with water and new owners turned it into a wonderful lake bordered by an extensive garden with lots of little walking tracks (and some big ones). There is a cafe and a camping area which the latest owners intend to develop in future. (Above: The front awning of the caravan can just be seen peeping out of trees on the skyline). We went for a long walk ….. This appeared to be a multicoloured broom, with a smaller yellow one growing in the middle. That was a lovely sunny day and I was hopeful that at long last I would see the Catlins in sunshine, but that night there was some rain and the morning was dull and quite cold. Nevertheless we set off on a drive of exploration with Slope Point and Curio Bay first on the list. At least till we got to the little township of Fortrose where a large sign told us that the Catlin Heritage Coastal Drives to both places were closed. Roadworks in preparation for the Christmas tourist season, probably. This is Fortrose – not much to see really, but an interesting history. We did eventually get to Curio Bay by a circuitous route, but Slope Point was still cut off. There is much landscaping being done around Curio Bay. There’s now a largish parking area and a track leading to a viewing point and then steps going down to the petrified forest. It is planned to link the Bay to a Recreation Reserve. After a quick visit to the “Falls” at Niagara we had lunch at the old Schoolhouse, sitting outside in a lush green setting. Unfortunately the food did not quite live up to its visual appeal. Tomorrow we are probably heading west. Or we might stay here another night and go for another walk in the gardens (and avoid any boardwalks). After six months getting our Christchurch home and garden into order, we’re on the road again, but not for long. We thought an invitation to a Clan Johnston(e) dinner in Invercargill plus a friend staying with us for a few weeks until her job in town finished was too good an opportunity to pass by! Asti is happy to look after the garden, goldfish and cats. particularly the latter. They will get plenty of cuddles. Living at home has softened us both – we’ve had to think twice about things we used to do automatically such as all the interior checks before taking off on the road. For example, making sure the interior power switch and water pump are off, the shower door secured, and anything moveable off the benches. We discovered too late we’d left various things behind like the TV direction tuner, a large serving spoon essential for the kitchen and the coffee (but at least we remembered the percolator). Apart from those we had the fridge pretty well stocked with vegies from the garden including a big bag of herbs. Our immediate aim was to attend a Clan Johnston(e) dinner in Invercargill in two nights’ time. No rush. So we spent the first night at the Oamaru Showgrounds, being VERY CAREFUL not to lose the caravan keys (as happened several years ago at that place). On next day through the green and yellow countryside – yellow gorse, yellow canola/rapeseed crops, yellow broom, yellow road signs, yellow road markings. Down the steep hill to Dunedin, at this time of year lined with gorgeous rhododendrons in full flower. I love Dunedin with it’s beautiful old buildings. We wanted to see the newly refurbished Otago Settlers Museum, and what a treat it was. Particularly the Portrait Gallery which took my breath away when I first saw it abut 16 years ago. All the portraits have been rehung, according to a system based mainly on the date on which the persons arrived in Otago. A touch-screen easily enables one to locate any particular portrait and any information about the person. And now …. the same on all four walls. Awesome. The Buchanan Family from Kirkintilloch were there of course, and amazingly there was also a display of household items which the family brought to New Zealand with them on the Philip Laing in 1848. Dave’s ancestral Gibb family also came from Kirkintilloch and probably knew this family; they may even have been related although this has still to be investigated in depth. There were lots of new displays everywhere and many touch screens. One that particularly impressed me was a whole series of old photographs of Dunedin streets; touch any one and up comes a modern-day photograph of exactly the same place. Even the awning lines coincide… It has to be seen and experienced to be fully appreciated. There were also many screens with videos of living people talking about (I presume) their families. While they ‘waited’ for some to touch their screen to activate their talk, their holograms could be seen to gently sigh, look around, shift their stance … it was uncanny, just like they were really standing there in front of you. We spent the night at a new NZMCA camp right in the town, very convenient, particularly as it had water and a dump site. Next day we made Invercargill without mishap and parked in the yard behind the Club where the Johnston(e) dinner was to be held. 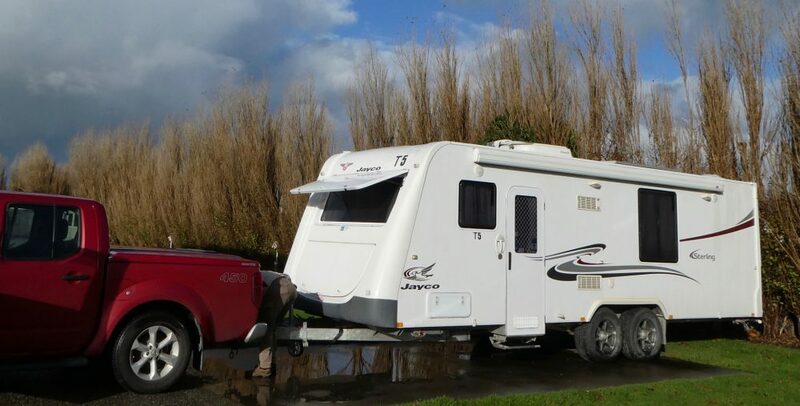 A perk of being a member of the NZ Motorhome and Caravan Association is the arrangement the Association has with various Clubs all over the country – very cheap or free parking and use of the Club’s facilities. We both got dressed up in tartan and sauntered round the corner and into the Club. What a way to go! The dinner was wonderful and we made some new friends. So many people had the surname Johnston and one even had the surname Gibb (no relation!). The well organised dinner bodes well for the success of the Clan Johnston(e) AGM and associated activities planned for next year. 205. Best Laid Plans …. For our last week in Melbourne – and in Australia – we moved into Jen and Peter’s comfortable home in Donvale, with the two black labradors Moosh and Marla and a couple of inquisitive chooks. Without Westy to worry about any more – as it eventuated it was sold very quickly – attention shifted to Grandy the Jeep. With only a week to go we didn’t really want to go the private advertising route, and after a few enquiries and visits to various dealers, were offered a good price (dealer’s price, that is) by the people we’d bought it from. But first Dave decided to put Grandy through a car wash – and the windscreen crack, formerly about 3 inches long, suddenly extended enormously! Drastic action was needed. We booked in for a windscreen replacement a long way from Donvale but not too far from the airport, took Grandy in, took a taxi to the airport and picked up a hire car, drove back to the windscreen place and picked up Grandy, then drove both cars to the Jeep dealer. After the long inspection-paperwork-coffee-handshake thing, we farewelled Grandy and drove ‘home’. That was the Friday before we were due to leave. The plan was to fly to Brisbane, spend two nights with Nic and Mick, then fly home on the Thursday. Returning ‘home’ we were feeling peckish so started to look for a cafe. We must have been in the wrong area as the only one we could see was in a block of furniture stores and obviously NOT very well patronised. Dave’s lunch was OK but my cream of mushroom soup tasted horrible so I only had a few spoonfuls. Which were still too many. That evening the symptoms of food poisoning became horribly apparent soon after we sat down in a restaurant with Jen and Peter. It took a while before they could get me outside. The special thank-you dinner never eventuated. Two days later I was still feeling out of sorts but we took off for Arthur and Joan’s at Moonambel, stopping for lunch at Malmsbury (‘magnificient’ is not an exaggeration says Dave, he loved his huge pie)…. … then to call in on Bron the daughter of an old Armidale friend at Castlemaine. The country around Castlemaine is very reminscent of Armidale particularly at this time of year with all the beautiful autumn colours. Then on to Moonambel where we stayed soon after our first arrival in Melbourne. At that time the country was in drought and the big dam was empty; it was wonderful to see everything so green and the dam more than half full. Arthur and I caught up on some more Darchy family history. Camera-shy ‘Honey’ is about 18 and recently survived major surgery. Beautiful gum trees were everywhere – Arthur and Joan have planted several hundred. Back to Melbourne and frantic packing and repacking and weighing of cases …. all ready for an early start for the airport next day. I was still feeling off-colour. Alas, the trip to the airport next morning became a trip to hospital …. poor Dave, trying to negotiate peak hour traffic in a strange city with a ill wife beside him. It’s a sort of hilarious tale in the re-telling but suffice it to say I ended up in the Short Stay Ward but all tests turning out negative, I was discharged that evening. I slept better that night than for several days and woke feeling refreshed although still not very hungry! Two days later the early morning found us driving the same route through the usual horrendous Melbourne traffic to the airport; this time we made it without incident (you can just hear Dave’s sighs of relief). Then the plane was delayed on the tarmac for half an hour while several head counts were performed; eventually it was concluded that there was a mistake in the paperwork and not a stowaway in the toilet! The rest of our trip home was without incident, after the usual boring wait in Brisbane. I was surprised to find that although AirNZ has a huge selection of in-flight movies, they now charge $10 to view the best of them. But there were enough subtitled ones left to make a good selection and the flight passed quickly. Quickly? It arrived an hour late, that is around 1 am Christchurch time, and we were so grateful that Dave’s sister Alison waited all the extra time then drove us to her nice warm home where we spent what remained of the night. Next day we got the Nissan started with the help of a neighbour, shifted T5 from her position at the back of the chestnut orchard to the front where there was power, collected an ecstatic Penny from the dog sitter, and settled down for the next few days. Our home was vacated the day after we arrived but will not be officially inspected and signed off by the Agent until Monday. I will probably not be posting too much in the coming weeks/months. We are going to be busy doing some renovations to our home after almost 4 years away. Postscript: I wrote this after leaving Westy at the caravan dealer. I have loved our time in Westy, exploring this great continent where I was born and catching up with so many of my old friends along the way. One part of me wants to continue, and/or to go back, particularly to outback Queensland where so many of my ancestors lived. But another part wants to return home, to our HOME in Christchurch, to live again with and enjoy our two cats and Penny the foxie before they get too old. Plus I have any number of family history books to complete, and a promised one about my life on “Cornelius”, and somewhere along the way I hope to consolidate this blog into the last one or two of a series of books. Since returning to Melbourne we’ve been busy getting Westy the caravan ready for sale. Dave managed to develop a cold but soldiered on, then kindly passed it on to me. We sorted out all the things we simply couldn’t bear to leave behind, such as the antique egg-cups bought at Glenrowan near the beginning of our journey a year ago and the left-handed stirring spoon bought quite recently, not to mention a couple – just a couple! – of things acquired in between. We’ve decided to leave most of the pots and pans, cutlery and crockery, camp chairs and table and sundry other items for the lucky new owners, but we took all the bedding and towels to a local vet hospital who advised us that the animal pound would love the sheets etc, which the vet didn’t want. Take note – Vinnies and the Salvos do not accept bedding, but the animal rescue places certainly do. Westy was scrubbed and polished inside and out – see how she gleams. Even the tyres. Here’s Dave removing the jockey wheel for the last time, after hooking up for the last time. So many last times (sad face). We towed Westy back to where we acquired her just over a year ago, and the same salesman (who still reminds me of my old headmistress!) is going to sell it on our behalf. He seemed confident. We will keep the Jeep for a little longer and perhaps get a new windscreeen. The crack which could not be repaired at Lake Macquarie but which was (hopefully) stopped from spreading has most certainly spread. Also the front wheel bearings have started to play up. Just when we don’t want any more expense. The Jeep (a Grand Cherokee Laredo) has been almost trouble-free, we even considered for a time to ship it over to NZ. During a few days’ hard slog it was lovely to be wined and dined each evening by our wonderful friends Roger and Jay who not only opened their home to us but arranged for Westy’s temporary park two doors down the road. We tried to reciprocate in a small way with a lunch at the Yabby Lake Vinyard on the Mornington Peninsula. Set on a hill with wonderful views all round, the gardens are further enhanced by some interesting sculptures. The vineyard looked very different to the ones in Blenheim, NZ. At this stage all the mature vineyards there would have their rather thicker-stemmed vines sporting short tops and sides. Here they seem much more spindly. We saw the same difference earlier when touring south-eastern Victoria. After a prolonged lunch with delicious Yabby Creek wine we returned ‘home’ via Arthur’s Seat, reminscent of the Port Hills in Christchurch, with a northerly view of the eastern Port Phillip coastline. there’s even a restaurant at the top of the cable lift. … and then this lovely copy of an old sailing ship, the ‘Enterprize’, which is a regular feature of the Bay. http://www.enterprize.org.au/ The copying is authentic down to the tarred sisal ropes. Dave was able to capture it in more detail another day. With Westy finally out of the way, we said goodbye to Roger and Jay and moved on to a cousin’s at Donvale. The two black labs gave us a lovely welcome. We still have eight days before we fly home. I had hoped to change our flight from Brisbane to Christchurch to a flight from Melbourne but apparently I can only change the date and time of the flight, not the departure point! So now we are booked to fly from Melbourne to Brisbane early next week, spend a few days with Nic and Mick, then fly home. We will have to dispose of the Jeep in the next few days but it was too rainy today to do anything. After disembarking at Queenscliff on the SW corner of Port Phillip Bay we were soon on the road heading for a camp at Princetown on the Great Ocean Road which had been recommended by several people. As it was a dark drizzly day we opted for the inland route. It seemed we would never get there! Up and down and around, much of the scenery reminiscent of Otago. We finally reached the camp at dusk and had to dodge lots of kangaroo poo while setting up – they and their deposits were everywhere. (That’s us on the left with the awning). Next day it was off to visit the Apostles at long last. Iconic scenery which I’ve seen in many photos – but you simply have to be THERE to take it all in. (I’m not apologising for the number of photos either). The road does not follow the clifftop exactly but there were designated parking spaces then usually a short walk to viewing places. The first one we went to involved a very steep climb – aargh! – but the view of our first Apostle on the “Shipwreck Coast” was worth it. After visiting a few more viewing places we reached the main Apostles viewing base, with plenty of off-road parking, an information centre, a helicopter base, hundreds of tourists even in this off-season and a tunnel under the main road …. emerging onto the headland it was amazing to see so many of the monoliths, lit by a watery sun. It was blowing hard and yes really rather cold! Further on we came to Loch Ard Gorge near where the clipper “Loch Ard” was shipwrecked in 1878. Only two of the 54 people on board survived. The “Loch Ard” is another sailing boat which features in my Johnston family history. Luckily he did not remain on the Loch Ard much longer, as seven months later she was wrecked on 1st June 1878 on a voyage from London to Melbourne, with the loss of 52 lives of the 54 passengers and crew aboard. In a later letter George mentioned having “run away” from this ship in Melbourne – more likely he signed off, or he would not have been able to claim sea time towards his mate’s ticket. But fate dogged him – he was drowned in the shipwreck of the “Cahors” off Evans Head (NSW) in 1885. We investigated the London Bridge – what an experience for the two people marooned on the new island. Dave leapt up and down the steps to the Grotto – he’s still half mountain goat of course – I stayed sedately fairly near the top. Having investigated most of the Apostles area we decided to venture inland to Timboon (lovely name!) where we had lunch at a whisky distillery after sampling several of their rather high priced whiskies. Very nice, but ….. ! Then back towards Princetown via the Cheesery (!?) where a lovely Kiwi lady was overjoyed to meet some fellow Kiwis (apparently I qualify now) and served us some delicious local cheeses. That evening we thought we might try and catch the apostles in the evening light, and although we were really a little late reaching the area we still managed some stunning shots. Early next morning we thought we’d try again for those special shots, but apart from us not waking as early as planned, the weather wasn’t really helpful. Rain squalls could be seen in the distance. The sea had got up a little too, which actually made for better shots I thought. We headed back towards Queenscliff on the Great Ocean Road in constant rain, stopping at Apollo Bay for a rather nice little lunch at a tapas-style bar off the main tourist drag, surprisingly thronged with tourists even at that time of year and in such weather. Thus fortified we continued but soon decided we’d had enough of the Great Ocean Road in the rain and headed inland – more twisty roads but at least the weather improved a little. We spent that night, the last in Westy, at the Geelong Showgrounds. It was a funny feeling to cook for the last time with all the cooking implements and crockery and cutlery which we had so painstakingly acquired from a variety of sources just one year ago. Sad too. And to sleep in the bed for the last time. Next morning we caught the vehicular ferry again and arrived at Mornington in good time. Our friends Jay and Roger have again arranged for us to park Westy in their neighbours’ front yard while we clean her up and get her ready for sale. So there we were settling back in the same place almost exactly one year since we first squeezed Westy in and started to get her ready for our Australian tour.